What we see here is a leaked early build which seems to be a 10 inch tablet from Nokia. The Finnish Multinational which is strongly holding on to its Lumia series for its survival in the market is now trying to get into a different space. As confusing as its plans are for its flagship devices, its confusing its users with its plans too. Although the company has been pushing its limits for user base, it has to keep its fingers crossed for this one. With the competition already heated up, it would be quite fancy to see if it even gets the current ( Heavily Demanding ) consumers all ears. 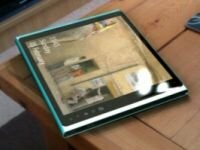 The rumoured specs tells that the Tablet would be manufactured in two variants – 8 ” and 10″ and it would sport a Qualcomm Snapdragon chipset which makes Windows 8 RT the only choice. Lets keep it fair till they officially announce it at the Mobile World Congress 2013.